Just a quick analysis of the gold it might take to level up all your abilities for 75 heroes to go from Level 70 to Level 80. DB tends to keep things pretty linear in terms of stats when going from level to level. This is true in terms of hero stats, like Attack, Defense, etc. It is also true in terms of the gold required to increase ability levels. Just for background, ability gold increases from level 1 to level 60 were a flat 500 increase for each level. There was a jump to 1000 per level from level 61 to level 70. So, I would anticipate there might be another jump when going from level 70 to level 71, and that that same increase would apply from level 71 to level 80. My analysis uses a 1000 increase per level as a baseline (basically the same increase we saw from level 61 to level 70). It also includes sensitivity analyses using assumptions of 1500, 2000, 2500 and 3000 per level. My best guess is that since they doubled the amount going from 60 to 61, they may also double it again to 2000 when going from 70 to 71. No way to know, so I'm including several different assumptions. The bottom line is that my bests guess is that it will take from 135 million to 168 million in gold to increase the abilities for 75 heroes from level 70 to level 80. As always, if there is a flaw in my analysis, I welcome the feedback. Thanks! I've been missing me some charts. Having just spent 100M last weekend on guild games ... I suddenly feel very poor >.> I wish they didn't release "meta changers" and then expect us to pay the absurd costs to adapt to them. Well, in the past few months, I've finished building and moved into a new house, and also officially retired, so been pretty busy! Hopefully I'll have more time to do analyses as interesting topics present themselves. I've been holding off on combat stuff until the revamp anyway. And yeah, I spent over 100 million on last gg as well - brutal. but I do have gold, and potions. Bring it on, 180 mill is chump change. Nobody's going to level all 75 heroes at once, of course. Many are utterly useless and unnecessary. When rising to level 70 I always leveled my PvP defense heroes, then offense heroes, then the ones that I used most in PvE. I usually got all of my heroes done before hitting the next player level, with XP potions in hand. In any case it will take time for anyone to actually reach player level 80, during which they can be collecting yet more gold. I never really understand how level 70 players can run out of gold, it is the easiest resource in the game to accumulate. So has it been announced somewhere that the level cap is going? There are no plans to increase the level cap at this time, this thread is just speculating a 'what-if' scenario. @Joel then how about as a special Halloween reward we get that one 'missing' stamina and kick up to a nice even 90 stamina? Yeah, sorry if I misled anyone. 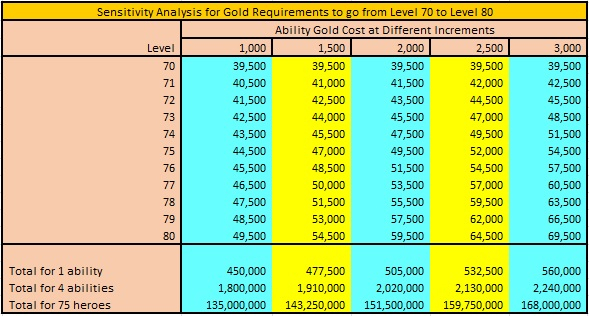 A few people have been asking me about the cost to upgrade from level 70 to 80 because there had been talk of the level cap increasing at some point, so I threw together an analysis. I should have prefaced the post with the disclaimer that nothing was confirmed in terms of increasing the cap. We had heard in the Summit that there were plans to raise the level limit, just a bit far off. Not "imminent" (TM) or "soon" (TM). Well that is a relief. Don't give the devs any ideas though @Foozle. Maybe make a thread about what would happen if the portals got fixed. I read that too. So are there plans or not, regardless of imminence? We appear two have to different stories from the same official source. If they increase the level cap before I tell them that I am ready they'll have something imminent coming for them! Well if you're a boss 100 player you need ~13 million gold a week just to upgrade the runes you get from PVP. So gold island, tower and dungeon gold is more or less just breaking even with that. Gold you get from actually doing PVP is profit but that's assuming you didn't do any crafting and nothing else came out that week which required you to spend other gold. In case of a meta change then suddenly those costs jump astronomically which is where the real spending comes in. Solaris for instance forced everyone to move runes around every which way as some common heroes became irrelevant and new ones demanded our runes. Since runes are roughly 200k a pop to move around that adds up really really quick. And at the time of solaris's release in particular matchmaking was insanely broken. So I know I for instance had to put a ton of gold in refreshing searching for hard teams to see if strategies and teams worked against 5k+ runed teams. So yea. It's really really easy to burn through gold and we always need more. This post is making me feel pretty poor as well. I'm in no hurry to see a level 80, 75 heroes is so much gold. You should add into your analysis additional heros as well. At the rate DB is adding new heros there could be as many as 90 out there before a level cap increase comes. 1. I'm NOT for a level cap increase. 2. I would rather see epics caught up and existing heros fixed BEFORE any new heros. 3. I STILL HATE RUNES! Just saying. I like runes. So many people running around with all heroes 6*FA. Eventually, foozle would calculate some game breaking meta that is the most op. Now, runes spice things up. I agree with the other two.